Save your search - find out immediately when "William Penn" is available at auction! Penn, William (1644-1718) A Brief Examination and State of Liberty Spiritual. Philip Boss (American, 19th Century) Two Portraits: Mr. William Penn Sheldon of New York State, and Possibly His Sister. 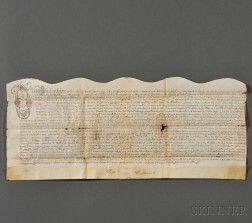 Penn, William (1644-1718) Signed Land Deed, 26 September 1681. 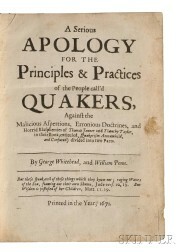 Pennsylvania Quakers, Land Deed, 1688. Anglo/American School, 18th Century Portrait Miniature of a Woman.